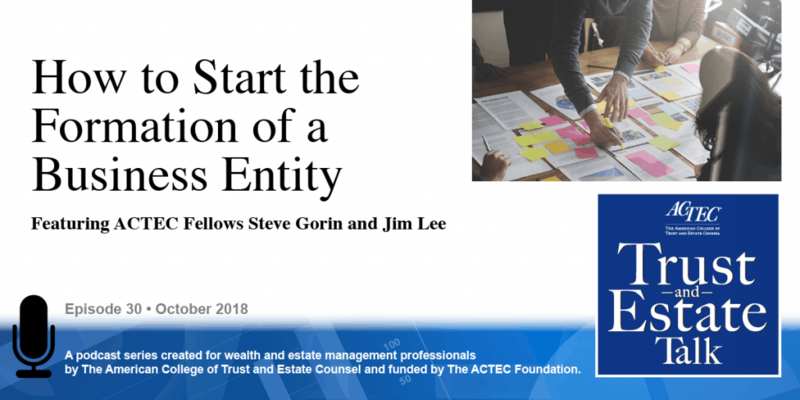 “How to Start the Formation of a Business Entity.” That’s the subject of today’s ACTEC Trust and Estate Talk. This is Katherine Ramsey, ACTEC Fellow from Richmond, Virginia. There are many considerations in forming a business entity, from choice of entity to tax considerations. 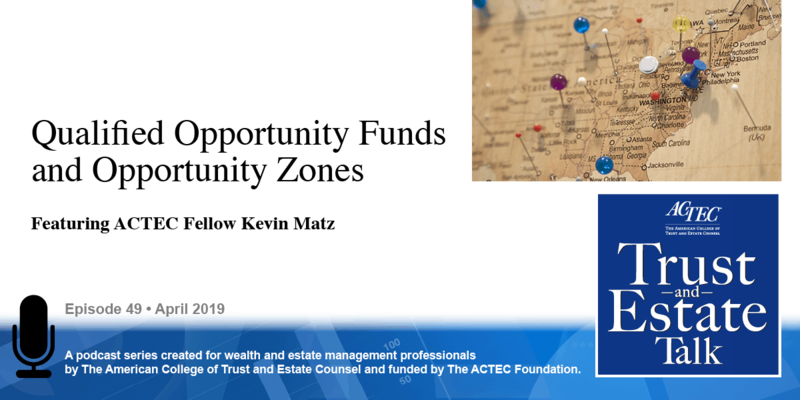 To learn more about this topic, we will be hearing today from ACTEC Fellows Steve Gorin of Saint Louis and Jim Lee of Phoenix, Arizona. Welcome, Steve and Jim. Let’s begin with you, Jim. Well, we want to talk about different types of entities, so, if you’re looking at, for example, a corporation, a corporation is taxed at the entity level but still provides nice limited liability. People often refer to a corporation – or rather the IRS – refers to it as an association for tax purposes. A variation on that is an S corporation. It’s still a corporate structure, but instead of the tax being at the entity level, it’s typically at the shareholder level. There are some exceptions to that, but generally speaking, that’s how that works. Then we have entities such as a partnership. 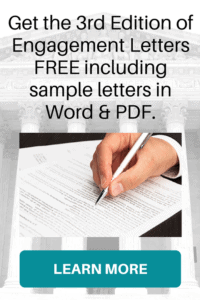 A general partnership does not have limited liability unless there is a special wrapper around that general partnership that’s sometimes referred to as an LLP, or a limited liability partnership, registration, or statement of qualification, depending on which state you have, and that can end up shielding general partners from general liabilities of the general partnership. More common in the family-planning context is a limited partnership where the general partner is exposed to general liabilities unless there is a wrapper around that general partner and the limited partners are mostly investors. That is also a passthrough entity in which case nearly all elements are passed down as tax items through K1s through to the partners. Then we have an LLC; with an LLC, it’s only one member. The default answer is that it’s a disregarded entity, and so all tax items flow through to the 1040 of the single owner, assuming the single owner is an individual. And if the LLC has more than one member, the default is that it would be treated as a partnership for tax purposes, but an election could be made, check-the-box election to be taxed as an association, or sometimes as we call a C corporation or taxed as an S corporation instead. 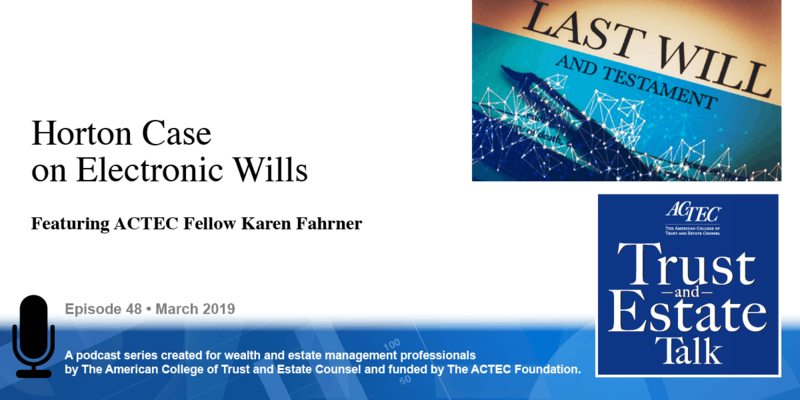 And so, that’s kind of the lay of the land of different entities to choose from, but because of some recent changes in in the law – tax laws – this becomes increasingly complicated. And Steve Gorin is going to talk about that. Thank you, Jim. So the 2017 Tax Reform drastically reduced corporate rates. Now corporate rates instead of having a top bracket of 35%, it’s a flat 21% federal rate for any corporation – a C corporation that pays its own taxes. Now, in addition, they’re going to have state income tax as well. So, now that that’s become a lot lower, think about what’s the taxation for a sole proprietor or a partnership or an S corporation, so the individuals or the trust that pays taxes there, they have a top bracket of 37% plus a possible net investment income tax of 3.8% on the federal level in addition to whatever the state tax they might pay. Furthermore, the new tax law added a 20% deduction for passthrough business income that can offset that 37% top bracket or whatever your rate structure happens to be. So, if you took 37% and subtract it off the 20% deduction – 20% of 37% is 7.4%, so 37 minus 7.4 is 29.6. The 29.6 federal rate, plus perhaps the 3.8, is still considerably higher than the C corporation federal 21% rate. However, when the C corporation will make distributions to its owners, there’s a supplemental dividend tax. Also, the federal rate and the dividend tax would be about 23.8% in the highest bracket. So, when you add together the dividend tax and the annual corporate income tax, that comes out to about a 47.3% bracket in the top bracket, whereas the top bracket is going to be perhaps 40.8% for the individual in the top bracket or maybe even a lot lower if they get that 20% deduction. So, it’s really kind of a facts and circumstances as to whether you should be a C corporation or a passthrough entity like an S corporation or partnership or sole proprietorship. Generally, I think your best bet is to be a flowthrough, continuing to be that. Now if you do decide – if you’re an S corporation – and you do decide you want to convert to a C corporation, there’s a simple procedure, like a check-the-box type of procedure where you can revoke your S election, but that is not the best way to do it. Because that imposes a five-year waiting period. So if you’re going to do a conversion, you should really consider doing a tax-free reorganization, and that’s beyond the scope of this podcast, but I’d be happy to explain to anybody who has a question. This 20% deduction – there are a lot of different tests for it; it’s limited; you have to pay enough wages. If you don’t have enough wages, but you have a lot of depreciable property, then that might also help you get that deduction; it’s also not necessarily even available; it’s not available to specify service businesses. So, as a lawyer, or suppose you have an accountant or a doctor – so you have to have a sufficiently low enough income – if your taxable income is too high – you’re not going to get that deduction. Now they did carve out architects and engineers from that, so they do get a deduction even if they have a high taxable income. And that’s because we lawyers and accountants are scum of the earth; we are evil people and the architects and engineers are doing God’s work. That’s the only explanation other than what Senator Russell Long, Chairman of the Senate Finance Committee, enunciated about 50 years ago: the major principle for tax reform is “don’t tax you; don’t tax me; tax the man behind the tree.” Now that we’re getting past some of our antics here, I’m going to pass it back to Jim to just kind of mention additional ideas. Sure. And even before I go there, I think it’s worth mentioning, I’ve worked with clients; I know Steve has worked with clients, to look at people who already have businesses. We’re talking about the formation of a business – starting a business. But what if you have a client who already has a business in place? Should they be switching around with entities for tax reasons? Well, people have been doing that for a very long time, but I have found for this new law that you really have to dig into the numbers; you have to get together with the CPA for the entity, and you’ve got to get down to the nitty gritty, because you may find in many cases that you’ve got a client that may have a 20% deduction or a 21% deduction, by the time you go through all the exceptions and the other nuances, they may be substantially less, and it may simply not be worth it and so you really have to look at that. Definitely. And they need to consider exit strategies too, because the tax laws could change any minute. Even though they call them permanent, a new Congress, a new President…sometime in our lifetime we’re going to have a new Congress and a new President. Some people want it sooner than later, and other people want it later rather than sooner, but we will see how it works out. But there will definitely be change. Remember the Tax Reform Act in 1986? That was the last thing that was called tax reform. The top bracket there was 28%, and last year, if you have the net investment income tax plus the 39.6% tax plus phaseout, the top bracket was over 43%. So, that happened even without what they called tax reform, so these things can creep up on you and so, the real question when you’re doing your planning is are you going to plan for contingencies? Or, are you just going to trust the politicians? Flexibility is the way to go, and so how do you do that? How do you handle that upfront when you’re meeting with a new client who’s wanting to form these items? Well, working with a checklist is a great way to avoid malpractice; having a thorough checklist together of the things you want to talk with your clients about – not only on entity selection – but just on general kinds of value systems and the things they want to make sure their entity can handle. Also, with respect to the type of management and who’s going to be involved with these other family members or these non-family members – and all of those questions lead to a host of others. Work with a great checklist, and if you don’t have one to start with, there are some out there on the internet that you can look at, I know ACTEC is working on updating its checklist for ACTEC members. 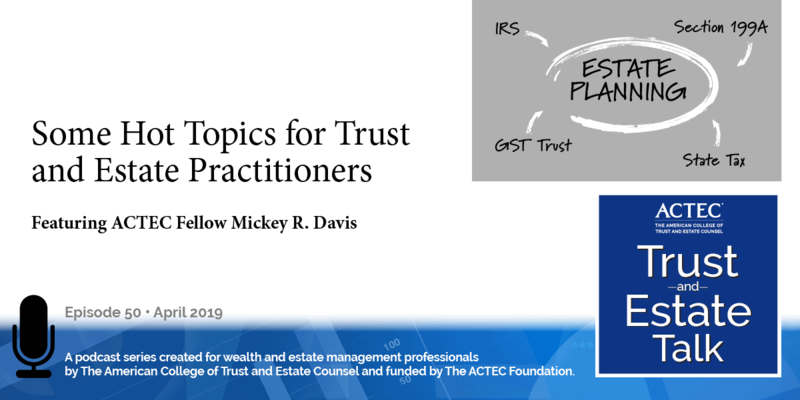 Also, ACTEC has recently put forth a new model agreement for LLCs treated as partnerships for federal income tax purposes, and so we want to recommend that to you as well. Thank you. We hope this has been helpful.